I just had the opportunity to attend training for Orton Gillingham's multi-sensory approach for reading instruction. This was by far the most beneficial training I've ever attended. I walked away with strategies that I could use the very next day in my classroom. If you teach reading and ever have the opportunity to attend Orton Gillingham training, I highly recommend it. So now I'm here to share with you guys some of the awesome things I learned in training. 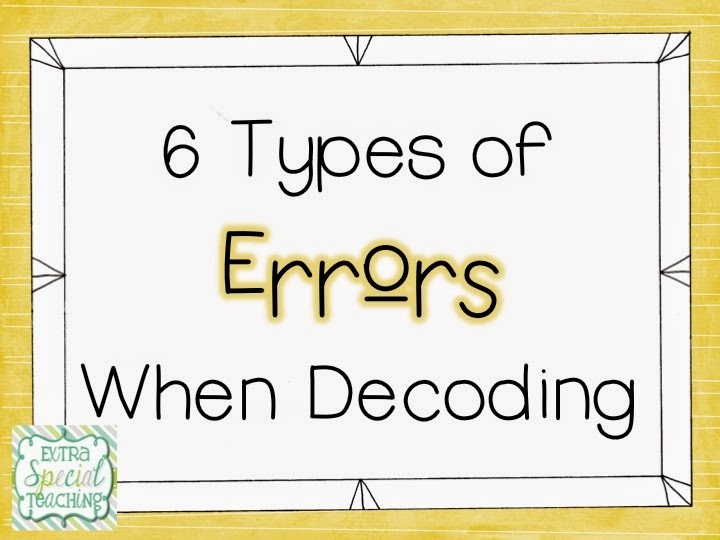 One of the first things covered were the types of errors that students often make when decoding. I know you've seen all of these errors before, since I've seen them many times. I never thought about how important it is to identify the type of error so that I would know how to correct the error. These errors aren't exclusive to just students with learning disabilities or dyslexia, but they are often seen in students with disabilities. Reversals with b and d are so common! Our trainer brought up some great points. 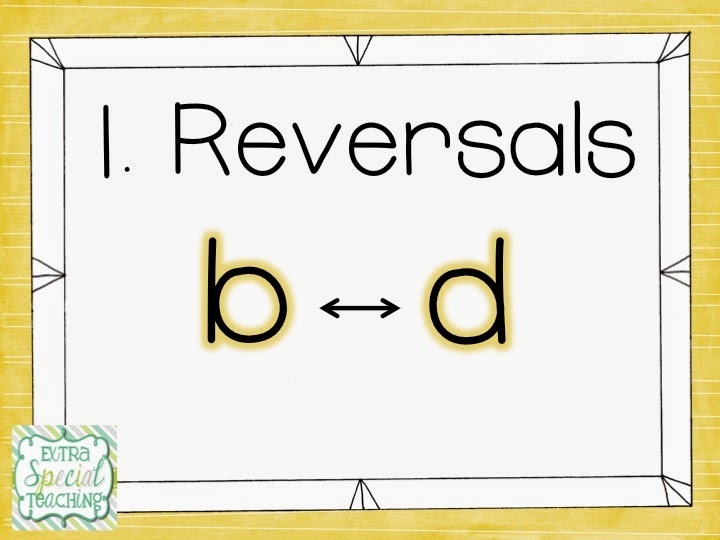 B and D reversals are developmental. But dismissing parent concerns by saying it's developmental probably isn't the best way to go about it. At what point is the reversal no longer developmental? Are we dismissing a legitimate disability if we say it's just developmental? Instead of saying the reversals are developmental, we can tell parents that "We're working on it." I love this approach! It validates parents concerns and let's them know we're trying to help their child. 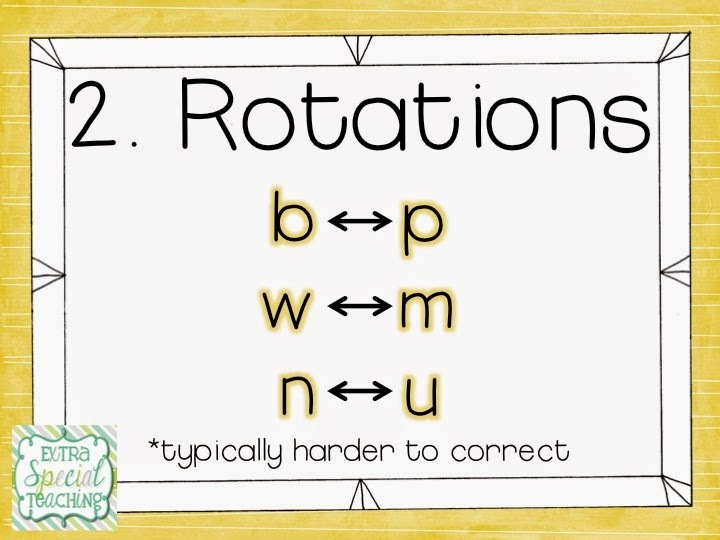 Rotations can signify a more severe learning disability, especially if they are confusing 'n' and 'u'. Rotations are often harder to correct than just B and D reversals. Oh man, I see this one every day with my students. 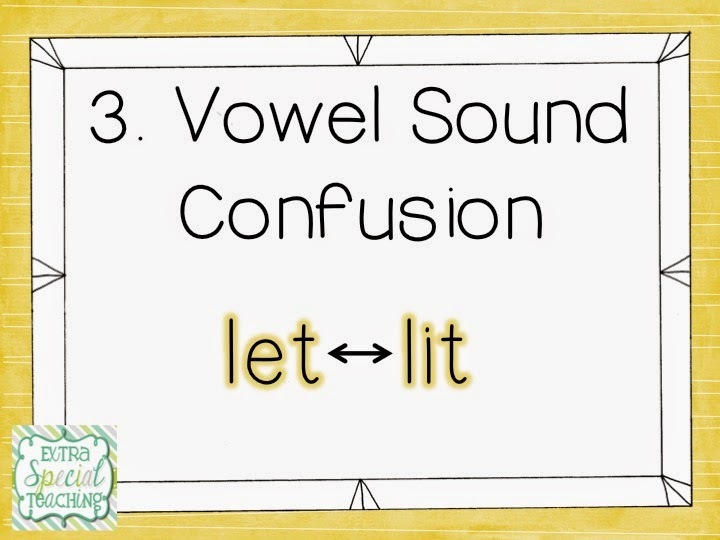 The short sound 'e' and 'i' seem to be the most commonly confused vowel sounds for my students. 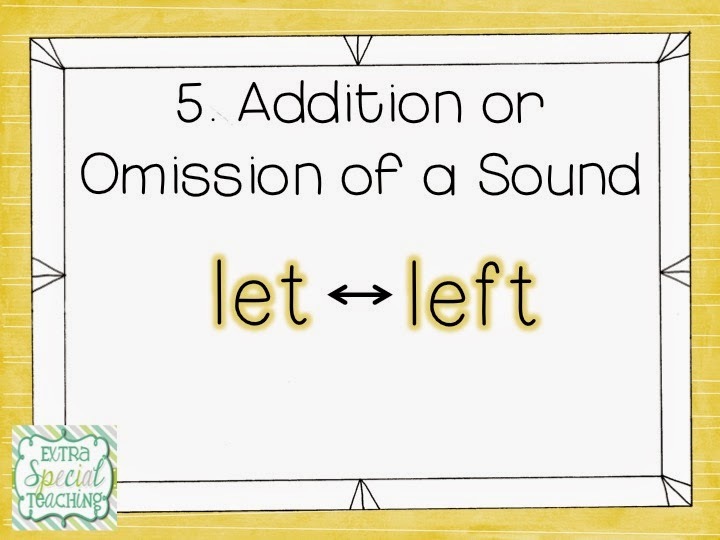 They do sound similar after all and really require the student to listen carefully and master the sounds of each letter. This can be a tricky error to correct, also. The students are reading all of the letters and the word looks similar. So it can be hard to convince students that they are reading the word wrong. We just started working on reading short vowel words with blends. This error was so evident in my students' reading. Over and over again, they would leave off one of the blend sounds. I'll often see students insert an 'r' or 'n' sound when reading words. My class is going to need a lot more practice to make sure we're reading all of the sounds in a word! This one is also a frequent error I see. 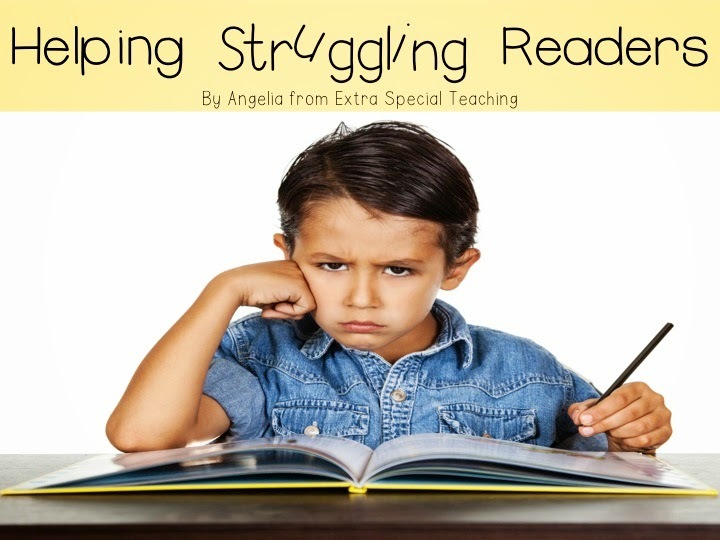 Students just don't know (or don't apply) the phonics rules to reading. The Magic E rule is one that is frequently not used. I've listened to so many students read the work 'make' as 'mack'. Our trainer pointed out that 50% of students do not need to learn all of the phonics rules in order to be successful readers. The other 50% will need that explicit instruction and direct practice of phonics rules to successfully learn to read. I don't know about you, but I don't believe I was ever taught phonics. Maybe I went to school during a time when the whole language approach was popular? 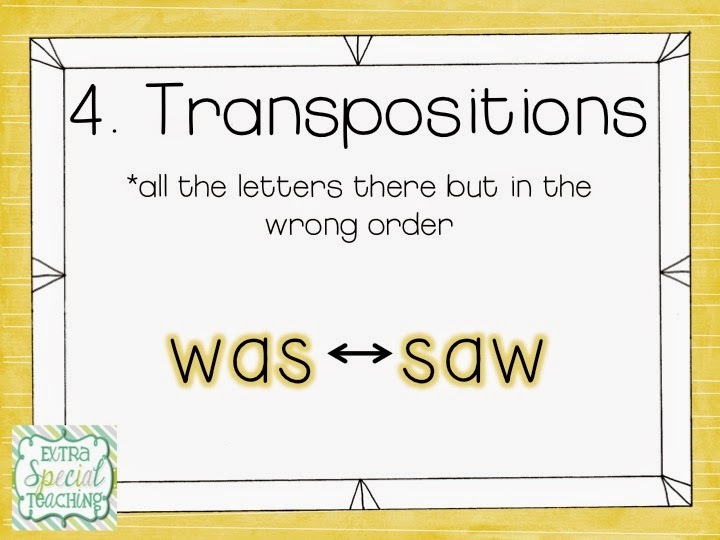 It wasn't until I became a teacher that I learned phonics rules. Even now, I sometimes have to double check the rules to make sure I teach my students the correct way. 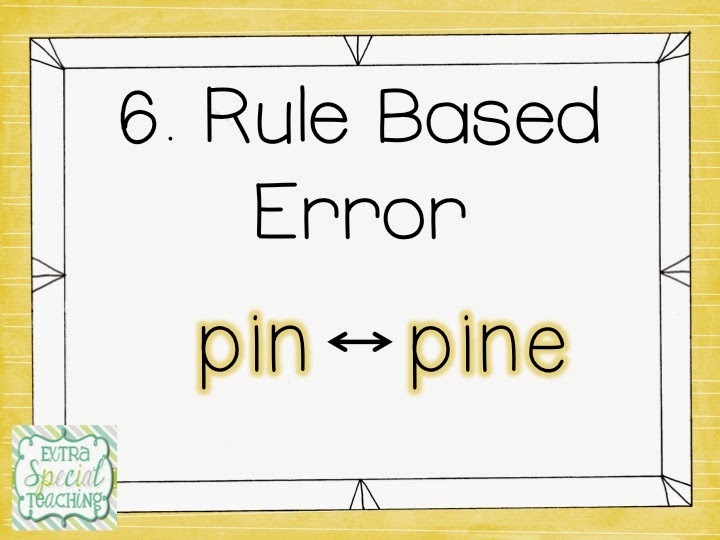 Next up in this series will be the correction procedures for when students make these errors. Now that we know the different types of errors, we need to learn how to help students read correctly and that can be the tricky part. I hope that this was helpful information! Great information! After reading through these, I can totally see these mistakes as my kiddos read. Thanks for sharing and look forward to hearing more! Fabulous information that will help when reading with student. I see the vowel sound confusion with short e and i all the time. First of all I LOVE your new blog design!! This is great information. I see so much of this and sometimes they grow out of it, but other times it doesn't get better. I would love to take an Orton Gillingham training. I have heard so many positive things about it :) Thanks for sharing! I was nodding my head the whole time as I read this! I want to go to an O-G training soooo bad, but my school says there's no more PD money in the budget. I mainly address no. 6 in my teaching, but I see the other ones ALL the time. I would love to learn strategies on how to address the other 5! Thanks for a great post, Angelia!! I see those errors everyday in the struggling readers that I teach! Looking forward to reading your post on correction procedures, especially for #2!! I was thinking of using a matrix with the letters (n, u, w, m) randomly repeated over and over and having him practice reading the letters then the sounds until he is fluent and accurate. I'd love to hear what ideas you have! Great post, Angelia! I'm going to share this with my primary colleagues. I'm also going to look for a local Orton-Gillingham workshop. Can't wait to read the next post in your series. Did you go to the Comprehensive Training (30-Hour) from O-G? I am currently a student studying special education and this is very interesting and useful information! I look forward to your future posts and what I can learn from them.